AiClay - a Haven of Miniature Food: Christmas is so last year. Christmas is so last year. Christmas Day was actually only 2 weeks ago, but the turkeys and logcakes and fir trees feel amazingly far away already doesn't it! So here are some photos to remind you of the loveliest festival. Of course it had to be Christmas-themed! and yes, I draw those little hearts everywhere haha. 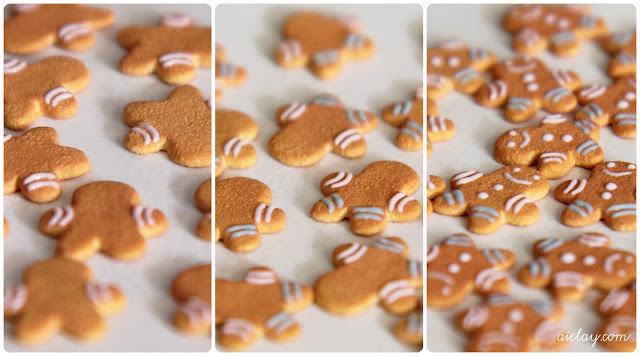 a little photo sequence on how to draw a gingerbread man. Oh, to everyone who participated in the New Year's free shipping promotion for AiMail subscribers, THANK YOU! ♥ It just ended on midnight yesterday, and I will be coming up with a promotion every month, so stay tuned. And subscribe if you haven't!